Rampant growth in food industry along with rising need for prevention of food contamination has accelerated the adoption of ethylene vinyl alcohol (EVOH) films for packaging. 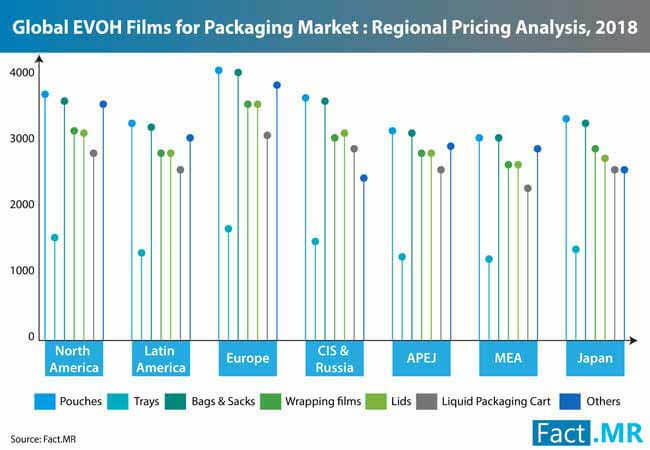 In a recent market intelligence published by Fact.MR, Asia Pacific is expected to be one of the leading markets for EVOH films for packaging over 2018-2028. Emerging trends of case-ready packaging products is likely to create lucrative dimensions for EVOH films for packaging market in the Asia Pacific region. Apart from food industry, incorporation of EVOH films in healthcare and cosmetics & personal care products is expected to be highly impactful on its market growth in Asia Pacific. Incessant rise in the demand for EVOH films from packaging industries to extend the shelf life of products and further retain the flavor in food packaging have been directly influencing the market. With higher demand for environment friendly products, manufacturers are making efforts to improve the quality and biodegradability of EVOH films which will possibly gain more traction in the near future. Further, rapid urbanization coupled with increasing demand for convenience food in emerging economies is anticipated to make Asia Pacific, a remunerative market for EVOH films for packaging. The Fact.MR’s study foresees revenues from EVOH films for packaging market in Asia Pacific, which has been divided in Asia-Pacific excluding Japan (APEJ) and Japan, to surpass US$ 1,00Mn by 2028-end. Majority of the Asia Pacific EVOH films for packaging market is expected to remain consolidated in APEJ, wherein the market is likely to expand at a robust CAGR of 6.7% during the assessment period, 2018-2028. Despite faster sales growth of EVOH films for packaging in India, China will continue to dominate the Asia Pacific EVOH films for packaging market, approaching nearly 40% value share by 2028. Overall growth of EVOH films for packaging market across the globe has envisaged by the Fact.MR’s study to register a moderate value CAGR of 4.7% during the assessment period. The global EVOH films for packaging market is estimated to attain market value worth US$ 2.8Mn by 2028-end. APEJ is expected to be the most dominant regional market with highest revenue share while North America and Europe complementing growth to the global EVOH films for packaging market. On the basis of application, the global market for EVOH films for packaging market is likely to remain concentrated in pouches segment. However, bags & sacks and liquid packaging cartons segments are expected to witness higher growth during the forecast period. By product type, cast film is foreseen to largely subjugate the blown film variants. The end use of EVOH films for packaging is expected to be the highest in food industry which holds over 60% of the market revenue share, followed by healthcare and cosmetics & personal care products. Although Fact.MR maintains a positive outlook of the market, major challenges associated with easy availability of substitutes will possibly create hindrance. In addition, EVOH films have limited scope for recycling and high water vapor permeability which are expected to hamper the growth of global EVOH films for packaging market.